Hi, starshines! Let's talk skin today. Why do you wear makeup? Well, let me tell you why I do. I believe that makeup can do wonders. Wearing makeup makes me feel better about myself. It's my confidence-booster. Call me vain but of course I want to look good in front of other people, and makeup can help me achieve just that. Now the next question that arises is this: Why is there a need for me to wear makeup? My skin is far from perfect. I have already told you my skin history when I posted about my *skin care routine* (which needs updating, btw) before. I had a lot of pimples during my late elementary and early high school days, and that made me feel really insecure about my face. Then after what felt like forever, thanks to the different products I used, the pimples started disappearing and my face started clearing up. Now, these are some of my main skin concerns: uneven skin tone, oiliness, redness esp. around the nose area, blemishes here and there. This is why I like to wear makeup. It temporarily addresses my skin concerns. Emphasis on 'temporarily.' I've come to realize that although makeup does well in concealing my imperfections, I still should not forget to take care of my skin. I should be doing something to keep my skin clear and healthy and not just be covering it up with thick layers of foundation all the time. I can't just wear makeup every time, you know. Sino ba naman ang hindi gusto ng super gandang skin, na parang naka-makeup ka na kahit wala ka namang makeup? There are now so many products out there that can help us take better care of our skin. We just need to be careful in choosing which ones to use. We first have to know what we need to fix for us to know how to fix it. 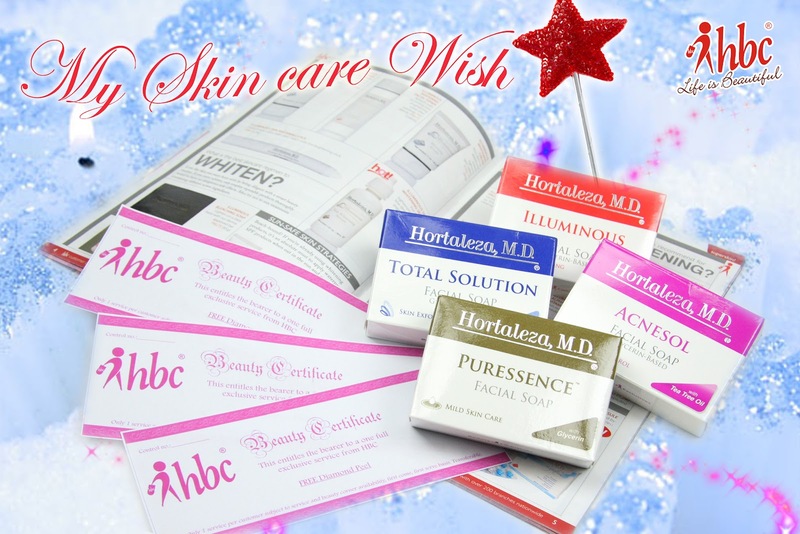 HBC wants to help you address your skin concerns through one of their skin care lines, Hortaleza, M.D. Their facial soaps were designed to target your specific skin care concerns. HBC is giving two lucky readers of this blog four (4) variants of the Hortaleza, M.D. clear soaps and Beauty Certificates for three (3) free diamond peel sessions each. Your Beauty Fairy's here now! Just tell her your skin care wish and she'll try to grant it! To join, just follow these instructions. Please read and follow the mechanics carefully. - "What skin concern would you like to address at this moment? If you were to write a wish to a Beauty Fairy, what will it be?" - "Make your skin care wish come true! Free Diamond Peel sessions & facial soaps from HBC and Codename AYA await! http://www.codenameaya.com/2012/07/giveaway-make-your-skin-care-wish-come.html "
- "Make your skin care wish come true! Free Diamond Peel sessions & facial soaps from @tweet_hbc & @CodenameAYA await! http://goo.gl/Kp3Ch "
The winners will be notified via email and will be given up to 48 hours to reply with their details. New winners will be selected in place of those who fail to respond within the given time limit. I sure like the Beauty Fairy to do something about my blackheads! My biggest skin concern are these blackheads all over my nose that just don't go away! I scrape all the gunk out (gross, I know, sorry), but they'll just come back within a few hours and are so annoying and ugly :( Pore strips + acne medicine do nothing for them. Beauty Fairy please help me, what I'm gonna do? Some advice please. Cant take it anymore. What skin concern would you like to address at this moment? I'd like to lighten my dark spots please! I've had a recent bout with pimples (I suspect it's because I didn't wash my brush for two weeks straight LOL) and now I have to lighten the souvenir that the pesky zits left behind. If you were to write a wish to a Beauty Fairy, what will it be?Dear Beauty Fairy, I ain't gonna lie. I hope you grant my wish of owning all the lipsticks of all brands in all shades all over the world (and please begin with all shades that HBC San San has ;P). I hope you felt the intensity of my need with my excessive use of the word "all". Thank you very much in advance. I'd wish for the Beauty Fairy to help clear my face from acne, shrink my pores and help me combat my oilies. my skin concern that i would like to address is the puffiness of my eye that make me look like a zombie and the acne marks which did not fade away. my 5 minute makeup routine is not enough because of these things. what products are needed to minimize the puffiness of the eyes and the small dark spots? would you help me beauty fairy? i wish these "dark elements" would fade away. my skin care concern that i would like to address is the uneven skin tone in my face. i want to eliminate the dark spots in my face. My dark circles on my eyes is my concern and if given a chance to make a wish it would be the dark cirles to fade away. I have oily but not so pimple prone skin. I also have blackheads around my nose. I seldom have time for extraction of blackheads. Make up is hard to keep because of my oily face. I also have uneven skin tone because of previous acne marks. I often get intimidated with these imperfections and I sincerely want to address them. Who doesn't want a flawless skin like a princess? But I cannot afford to go to derma every month. the the worst pimples that leaves mark on my face. sometimes I even forget to prettify myself. I know I need help. that make obvious wonders on face! i have problems with my skin; when i wake up in the morning, it seems that i will can fry eggs and bacons due to too much oil. at noon, my skin gets darker na because the effectiveness of the face powder is gone, i have frequent breakouts maybe because of oily skin and worst, my skin looks really old. please help me achieve younger, smoother and whiter skin so i can be more confident and be happier with my self again. thank you very much for whatever help you can give me. I wish the Beauty fairy can help me solve my skin problem and help achieve smoother and whiter skin so i can be more confident! thanks! I was suffer and discriminate by others with my dark skin. I want to have a fairer skin so that I ill not be shy to show off my skin specially at the beach. I know dark skin is beautiful but when you're in the Philippines skin is very important and fairer skin makes me feel more beautiful and give me more confidence. Please grant my wish. pls pls pls! My biggest concern is the dark spots on my face. Ive always been a beach lover and maybe the reason of my melasma. If I were to wish to a Beauty Fairy..that is to give me this chance to win this giveaway. I knew that diamond peel procedure can adress my problem. I dont have a blog but Im hoping to win.Thank You so much for this giveaway. What skin concern would you like to address at this moment? If you were to write a wish to a Beauty Fairy, what will it be? my concern is to whitens my skin and since i only using whitening product if i have budget... on and off.... i hope i coul be the luckiest one to win!! My biggest concern at the moment is my post pimple marks and freckles. If I were to wish to a beauty fairy, I just want to lighten it so that I can have more self-esteem. Having dark spots on my face somehow lessens my confidence to face other people without heavy concealer or makeup. The skin concern that I would like to address and tell Beauty fairy are my stretchmarks. I know that stretchmarks are marks of being a mother, however, I wanted them to be lighthen than what they appear right now as I had given birth last May. Skin concern that i would like to address is my oily and pimple prone skin! Please help. My skin concern is my blackheads on my nose I've been battling this problem since high school and I've tried so many remedy from strips to mask even alternative like white of the egg, so I would like to wish to the Beauty Fairy a solution to my problem..
My biggest skin concern is those dark spots appearing in my face, somehow it looks like freckles. maybe its a sign of aging too? My concern for a lifetime (maybe) is my pimple scar. I wish there is a magic eraser to remove them all. I need your help big time. Are there ways to at least reduce fine lines and wrinkles? I'm in my mid-30s and signs of wrinkles, age spots and sagging is already showing. I hope so because these can make me look older. My skin concern as of this moment are my whiteheads. I want them all gone so Beauty Fairy please grant my wish! Remove all my whiteheads and I'll give my skin more love! I've outgrown puberty, but I still get pimples from time to time. These pimples leave behind unsightly. I want to win this contest so I can get rid of those spots and reveal bright, clear skin. Who doesn't want flawless and glowing skin after all, right?